In this article, I will show you an example of Android’s RatingBar. A rating bar shows a rating in stars. The user can touch/drag or use arrow keys to set the rating when using the default size RatingBar. Other than default, we have other styles too which we will see in this article. Some important attributes of rating bar. stepSize This is the unit of the size you can increase or decreases as you drag the rating bar. In the main activity, you find the rating bar widget and set its value to the rating_result text. This would be the RatingBar’s default value. 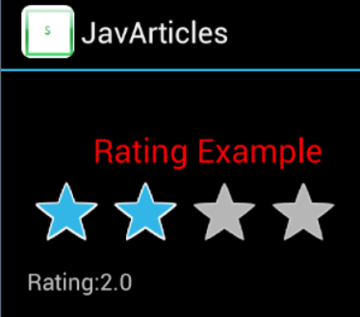 We also attach a listener to rating bar using setOnRatingBarChangeListener. In OnRatingBarChangeListener.onRatingChanged, we re-set the rating_result value. When you start the app, the rating widget shows up with the default rating. Let’s change the rating to 3.5. The listener attached to the rating bar updates the text value showing the rating result. Let’s add two more styles of rating bars. The smaller RatingBar style ( ratingBarStyleSmall) and the larger indicator-only style (ratingBarStyleIndicator). Both of them do not support user interaction and should only be used as indicators. If it is an indicator type, you can also use isIndicator and set it to true. 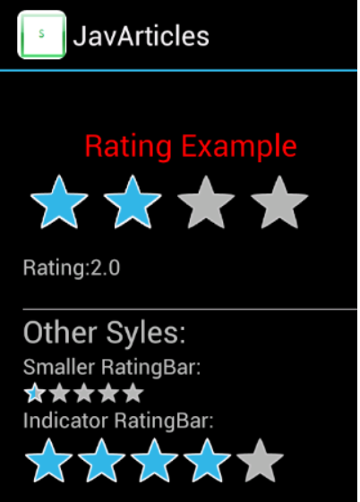 We have added ‘Other Styles’ of rating bars. Both the rating bars, the small styled and indicator type, only indicate the rating. You can’t change them.